This morning’s attempt (with the pre-constructed Lore and Tactics decks working together) resulted in a loss, with 53 on one threat dial and an even 50 on the other. Half the characters were one wound away from death, in spite of two Lore of Imladris, Self Preservation, and Glorfindel. 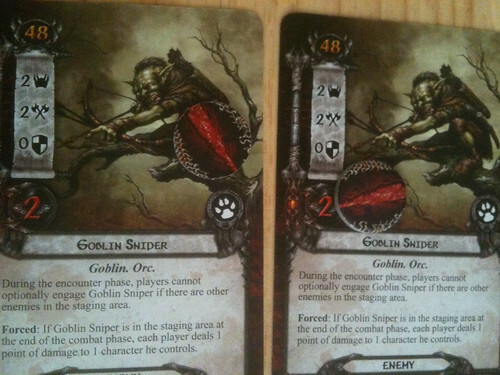 This would be thanks to a constant stream of enemies plus two Goblin Snipers in the staging area, each of which ensured the other couldn’t be engaged and could sit there, dealing four damage (two per side) per turn. To add insult to injury, on top of that we managed to get away with killing the first Hill Troll and surviving a Gladden Fields on top of that. These would have been great trophies at end of game (knocking 7 points off the score) but when the second Hill Troll came out, we were screwed. With threat building up each turn in the staging area, the biggest mistake was probably not traveling to the Fields in the first place, thus removing its threat cost of 3 from an area. Even 8 quest points couldn’t get through the staging area. A lot of the game boils down to threat control. 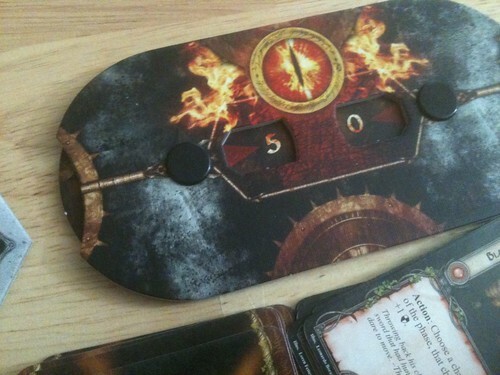 All decks need a serious aspect of this, or they’ll be defeated by either the enemies that swarm when the threat dial is too high, or reaching plain old 50 on the dial. 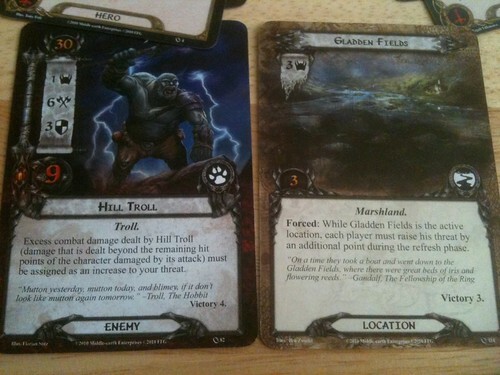 Threat comes from both enemies and locations, so being able to deal with both is important (and is also why a pure Tactics deck is so difficult to win with; it has no way of dealing with locations until it pulls out Blade of Gondolin or is packing Legolas). I’ve lost all of my games against the Journey Along the Anduin scenario, except for one: when I used this 3-Sphere deck, which resulted in a score of 34. It’s a bit crazy, since such a deck technically spreads your resources thin, but the deck itself is flexible enough with card draw that it can manage to pull off quite a few tricks even with the somewhat paltry resources of the Core Set. I highly recommend it, especially as it requires only one set (and I think this is its best advantage).